If there is one food event that you must attend this year, it is the Sunset Supper at Pike Place Market! Seattle is well known for many of its iconic landmarks, but the most visited and vibrant landmark is undoubtedly Pike Place Market! Tourists and locals alike love to visit the Market to take in all of the great food, produce and crafts the vendors have to offer. I know that when I have family and friends visit Seattle, the first place I take them is the Market. There is so much to see and take in when you walk through the historic Market. From the amazing seafood, to the fresh, local produce, the beautiful flowers, and the wonderful art and crafts, Pike Place Market has something for everyone! Pike Place Market is continually voted one of the best public markets in the country. We truly are very fortunate to have such a great market community here in Seattle that has such a deep, rich history. Many restaurants throughout Seattle rely on the market for their amazing seafood and produce. Pike Place Market isn't just a collection of amazing vendors, it is a community. At the heart of that community is The Pike Place Market Foundation. The Market Foundation helps their low-income neighbors who work, learn and live in and around the Market. They provide a food bank to feed the hungry; a preschool available to low-income families; a medical clinic offering care for homeless, low-income, and elderly clients; and Heritage House that offers assisted living to seniors. 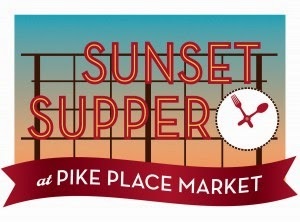 To help the market remain a thriving, caring community, Sunset Supper at Pike Place Market gives people the opportunity to spend a special evening at the Market where you can savor some of the region's best restaurants, wineries, breweries and distilleries. You can meet local chefs and winemakers as you enjoy a warm, summer evening at Pike Place Market. The event is always a highlight of the year for the Market, and it also offers live music! Proceeds benefit The Pike Place Market Foundation. Don't miss out on one of the most anticipated events of the year! Purchase your ticket today, and prepare to take in the wonderful wines, delicious foods, and the amazing atmosphere of the Sunset Supper at Pike Place Market! Click here for a complete list of vendors! For complete information on the Sunset Supper and to purchase tickets, please visit The Pike Place Market Foundation website. Pike Place Market is great, wish we could have similar place for events in New York. The manager and chef both were amazing. Personally, I think the space is laid out really well and the size of the venue keeps pulling great parties.